You have a few different options when it comes to pool covers, and a few things to consider. Like it or not, winter is on its way. The best thing you can do for your pool this winter is making sure you get the right cover to keep dirt and debris out, and make life easier on you come spring. Here are the three different kinds of pool over options for winter, and their respective pros and cons. A standard winter cover is made from a tarp like material and will get the job done for a few years before having to be replaced. While this is the most economical option, its relatively short life span is one of the biggest drawbacks. Plus, a standard cover is usually held in place by water or sand bags and won’t hold much weight. Heavy rain or snowfall will require you to clear it off before the cover sinks into the pool. A security cover is more expensive than a standard cover, but offers plenty advantages to justify the price tag. 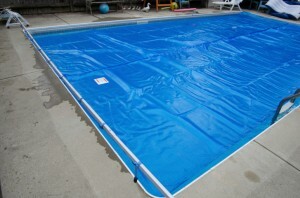 This type of pool cover is usually attached to anchors in the pool deck with spring-loaded straps. Security covers come in two types, mesh or solid vinyl. Mesh covers last longer and have less upkeep considerations since it allows water through but catches solid debris like leaves and branches. The downside is that your pool water will require more work to recover from the off season. Solid vinyl covers will require a pump to remove water that settles on top of the cover, but will do a better job of protecting your pool water. Automatic covers are obviously the easiest to put on and take off, since all it takes is the flip of a switch. These covers can also work as solar covers during the late summer and early fall season, and are great for keeping unwanted guests out of your pool. The downside is that automatic covers have a lot of moving parts that can break down over time. These also aren’t the strongest covers, since they aren’t technically winter covers. With some models, you may have to open the pool cover when there’s a big snow storm on it’s way. This entry was posted on Friday, October 21st, 2016 at 9:29 am. Both comments and pings are currently closed.